2019 Gronk Watch: NFL? WWE? PG13? Discussion in 'Blinded by the Lombardis: Patriots Forum' started by CaptainLaddie, Feb 4, 2019. With a ride to the game in OJ's Hertz rental. May mean nothing but Reiss noted that Gronk has been a regular at the stadium since the season ended. Daily application of leeches to that swollen quad. #Patriots TE Rob Gronkowski reportedly told teammates that he wants another Super Bowl win. Well this will get the speculation cranked up. Breaking: Rob Gronkowski is selling his penthouse Seaport condo. Click here to purchase (stick tap to BoMag and Mut). Eh---even if he comes back it's not going to be for many more years---and I doubt he's living in NE when he retires. This might be just him getting ahead of it, even if he's coming back. He could also just be upgrading to another Seaport unit given all of the development since he bought this one in 2016. More noteworthy the Squatty Potty that he keeps in the bathroom on display for these tours. Does he still have the house that was broken into during SB 52? 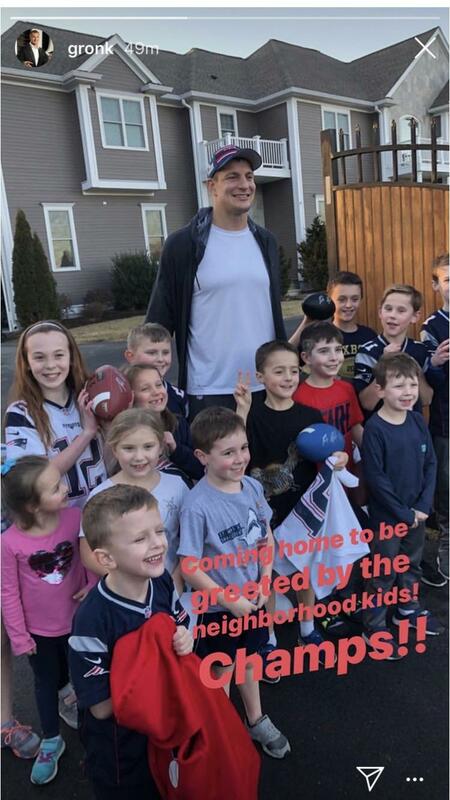 He took this pic with neighborhood kids after this Super Bowl. I think this is the house that was broken into during the last super bowl. Maybe the Seaport place is more for the brothers/family? Spiral staircase in party house is just a really bad idea. Did Gronk ever have #82? It wasn't Glenn's jersey. Edit: It was Dan's. I forgot he played 2 games in 2011. Framed 82 jersey with gronks name on zillow. A must for anyone with a bad back. I also saw framed jerseys for Daniel Murphy, either Bourque (I think), and maybe Yusemerio Petit, though no 66 with that last name is showing up on Baseball Reference. Photos from the real estate listing on Zillow. OK, click and scroll to page 6 and 22 for framed 82 jerseys. Also one of Daniel Murphy #28, Mets, on page 23. He’s got the same dumb smile as all the kids. Is there a single person that would be against that? Is there any meaningful difference between an off the record retirement or just a PUP or something? I imagine his cap number comes off the books if he retires and he'd only receive a pro-rated portion when he comes out of retirement compared to getting his entire 2019 salary if he went on PUP with the Hellenic flu. Yeah, I was gonna say, this sounds like it could be an amazing skirting of the rules, though my guess is there’s something in the CBA preventing it without a cap penalty. I don't see the issue. It's pretty unique situation. McGinest isn't the first to bring it up as a possibility. right, how many teams' coaches would want a player who misses training camp and half the season? how many locker rooms would welcome someone like that back? I realize Clemens and Pedro and others did it in baseball, but that's basically "sit by the phone and wait for it to ring in May". Yeah, I’m sure Belichick will be thrilled with answering “When is Gronk coming back?” questions every Monday and will embrace a player who shows up in Week 6.
Who was the RG a few years back, — my memory says Brian Wilson, but I know that’s not quite right — who had the agreement with BB to show up for like the last week of training camp? And I know there was an interview recently with Mark Bavaro about his special treatment under BB in Cleveland. So I’m not ruling anything out. I think he will hold up ok.
Logan Mankins held out for half the season, went public with some of his dissatisfaction with the Patriots, and still got a contract. Every player is different. Belichick has given Gronk some rather extraordinary measures, such as no preseason (for him that’s extraordinary) and likely holding him out of games he’d have expected others to play. Gronk has also built up a ton of sweat equity and overcome and incredible number of serious injuries to help the team appear in 4 Superbowls and win 2. I don’t think many teammates, if any, would be upset to have Gronk do something like this for a year or two. It’s just the right situation for it, and they all want rings. Now Belichick might still say no, but I think he’s more likely to be more lenient with Gronk than others. Rapoport is wrong so often when it comes to the Pats I am now convinced he will be retiring. i'm going to say it again, and whatever, i could be wrong, but... he's not retiring. What exactly is a “hot yoga class”? Bikram? Beautiful people? In demand? What? Hilarious that he was “super stiff.” On a serious note, hope his thigh is all healed from the SB. Seriously? It's yoga in a high temperature, so yes Bikram. Given Gronk's extraordinary blocking, how would holding him out 6 or so games impact the running game? Stupidly persnickety, but yoga at high temperature is not necessarily Bikram yoga. Bikram is a specific set of poses done the same way each session, at a set temperature and humidity. It’s typically a more grueling regimen than hot yoga, which tends to be more therapeutic and less of a work out. Fully extending his arms, Gronk would have a wingspan of all of those people. Hope Laddie be right. He's certainly not retiring from finding increasingly creative ways to hit on hot women. But then, that's not something you retire from. Neither is working out, if you're the type who makes the NFL. I am unconvinced by this evidence, as awesome as the story is.